What a difference a day makes! Yesterday, we were enjoying 60-degree weather as we put up our banner and today has been full of intermittent snow showers. This is Colorado – and one of the reasons we love it! 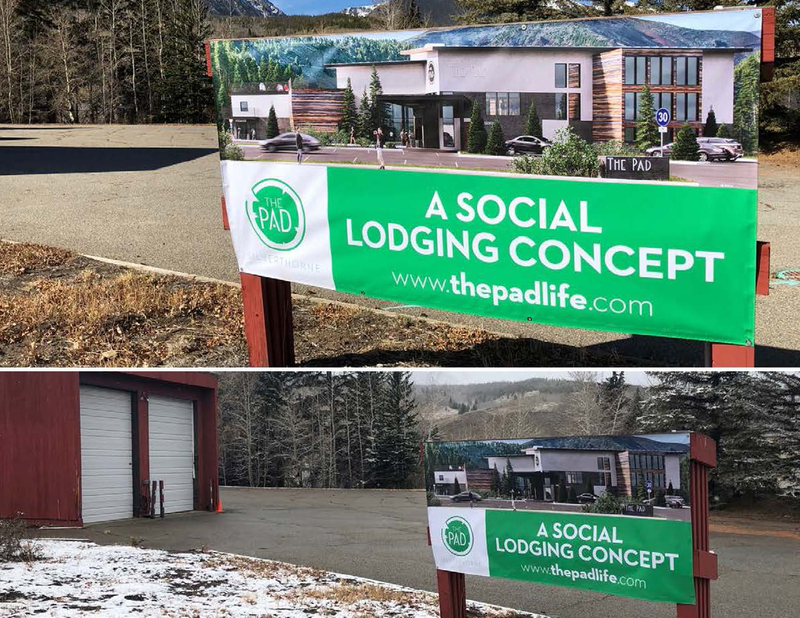 Welcome to our blog – we’re going to keep track of the development of The Pad through our photo journaling as well as this blog. We have some ideas of what we would like for content, and will keep it light and fun. Hopefully by reading our entries you’ll feel like you are on this journey with us – and will get an idea of what life is like living in Summit County – and that will make you want to come visit! It hopefully will also encourage us to get out and enjoy our surrounding environment as well. Working on The Pad is our priority, which oftentimes means we get to enjoy being here by looking out through our windows (not complaining, it is still beautiful) but will be nice to get outside more often! This is an exciting step. The sign looks great! The Pad Hostels © 2019. All rights reserved. Stay in the Loop and join our list!